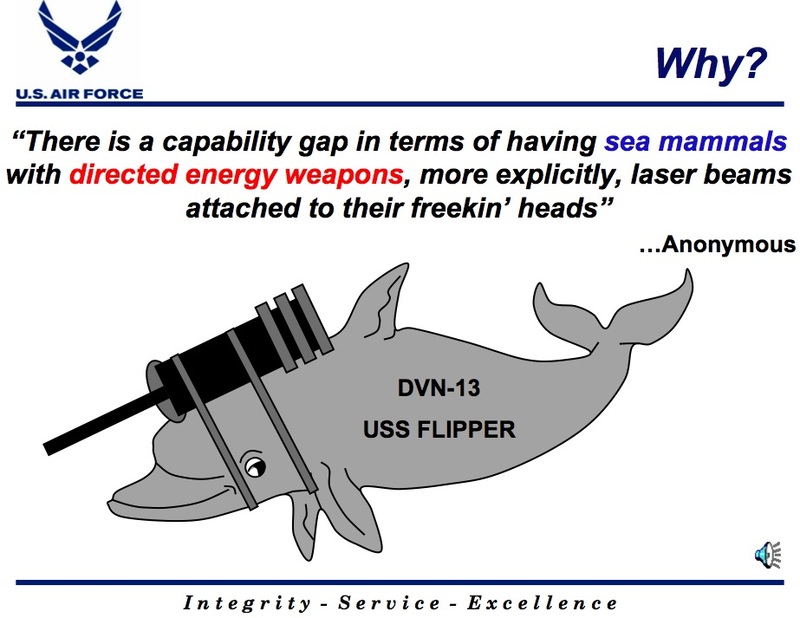 This page contains all of the posts and discussion on MemeStreams referencing the following web page: Danger Room - Flipper Fires Lasers in Air Force Brief. You can find discussions on MemeStreams as you surf the web, even if you aren't a MemeStreams member, using the Threads Bookmarklet. Noah's recent posts on the Airborne Laser and reflected laser beams reminded me of a spoof on a Pentagon PowerPoint briefing that was making the rounds in the Defense Department a couple fiscal years ago. Better than any article, this briefing captures everything that is wrong, funny and horrifying about outrageous Pentagon weapons that sound too good to be true. I'm posting the briefing, called Directed Energy Sea Mammals, for those who weren't on the e-mail chain when it first came out. The author of the original Air Force PowerPoint is a mystery (I've also seen a Navy variant of it). The presentation is question is quite amusing. There are redundant posts not displayed in this view from the following users: Shannon, Cypress.